One of the most crucial elements of shooting is proper ammunition selection. Although a number of great ammo manufacturers support the market, there is still a large segment of shooters who prefer to custom load their own ammo. There are many benefits to doing so, and lots of options for shooters when it comes to the best reloading press. ​Out of the reloading presses we reviewed, it was difficult to narrow it down to the best one. In the end, the Rock Chucker Supreme from RCBS rose to the top of our list. Built to last for years to come and with plenty of room for long magnum-length cartridges, this press is one that works well for those just getting started with reloading along with seasoned pros. The RC Supreme press is highly reinforced and has several safety features, making it our top pick. With its simple to use operation, superior strength, and an ambidextrous handle, the RC Supreme is ideal for all users, regardless of skill level. Because of this, it gets our vote as the one of the best reloading presses. ​Top Reloading Press - Rock Chucker Supreme: The Rock Chucker Supreme represents a mid-range investment for the reloader. It is a strong, sturdy single stage press capable of handling everything from handgun to ultra-long rifle rounds. ​Top Progressive Press - Hornady Lock N Load Auto Progressive Press: An automated progressive press with quick change Hornady Lock N Load bushings to quickly change out dies, and a number of other features to greatly increase output. Be sure to read through our guide to find out what important features each of these presses have, along with our other recommended picks. But, before that, read through our Buying Guide to learn the features and qualities that are very important when selecting a press to reload your ammo with.. The most important thing about reloading your own ammunition is the ability to have control. Whether you want to reload to save money, produce a more accurate load, or tailor charges to your own need, having the control over your ammunition is a great benefit. As an investment, reloading equipment can ultimately pay for itself in the end. Whether you’re making plinking ammo or trying for a match-accurate load, reloading can save you a lot of money in ammo - especially if you reuse components such as brass and buy components in bulk. We’ll get a little more into all of the capabilities of a reloading press later - but it’s safe to say that reloading equipment is a great investment for the dedicated shooter who will use it for years to come. Although all reloading presses do the same job, they don’t get there the same way. Reloading presses range from the very simple to fully automated workstations that work at a production speed. A single stage press, as the name implies, performs all of the reloading operations one stage at a time. Single stage presses are very common because they get the job done at a low cost, have few moving parts to break, do not take up much space, and are known to be very solid. On the downside, a single stage press requires much more time to finish a completed round than more complicated presses. Because each stage of the process must be set up individually, the most efficient way to reload with a single stage press involves setting up to do one part of the process - depriming, resizing, etc, and working in large batches. ​For the person who has to work within a restrictive budget, small space, or just wants to get started with reloading, a single stage press is a great investment. Even veteran reloaders find utility in single stage presses for their utility and strength. However, many reloaders find themselves later upgrading to a quicker process eventually. ​The turret press is the next stage in the reloader’s evolution. For somebody who needs to load larger batches of ammo, a turret press offers them flexibility and improved speed. In a turret press, dies are set up individually in a rotating turret. As the brass is processed, the reloader simply rotates the turret to the next stage. In this way, one cartridge can be completely finished through the rotary process without any additional set up. For an experienced reloader, this is a much faster way to produce a batch of ammo. Additionally, a turret press can be a time saver in changing between calibers. Most will support the capability to set up additional turrets with dies for any caliber the reloader frequently uses. Once the dies are initially set up on the turret, the whole turret can quickly be replaced and the shooter ready to reload a different caliber with all of the dies already set. ​The progressive press is the final stage in automation for the reloader who needs to crank out lots of ammunition. Setting up a progressive press can be very expensive and time consuming. As well, because of all the moving parts, they require maintenance and supervision to ensure that everything continues running smoothly - one thing out of place can affect the whole line. With a progressive press, dies are held in a circle like with a turret press. However, each operation is done simultaneously. So, for instance, the first piece of brass is being deprimed while the next is being resized. As a result, the reloader goes from a piece of brass to a completed round of ammunition in one set up. Obviously, the progressive press greatly increases the speed of production. For the shooter who needs to produce many hundreds of rounds of ammunition (especially in one specific caliber) a progressive press gives unrivaled output. ​How do you know which reloading press is the right one for you? Let’s discuss some things to consider. The size and weight of a press affect not only the space you need to house the unit, but also the performance of the press itself. Any time you’re putting large amounts of mechanical force into an operation, extra mass equals more rigidity. If you’re setting up a reloading room and have a nice, solid bench where the press will go and not likely be moved, a larger, heavier press may actually be in your favor. On the other hand, not everybody has access to that kind of space. Consider the person living in a small house or even an apartment who wants to practice reloading for the benefits but doesn’t want to commit the large amounts of space to it. In this case, a small single stage press might get the job fine and fit within your requirements. Single stage presses can be had all the way down to small, hand-operated single stage presses that require no mounting. Obviously this wouldn’t be the most comfortable or powerful solution, but would solve the issue of limited space. ​What type of ammo you intend on loading will tell you about the type and size of press you need. Handgun cartridges require very little in the way of pressing power, due to their small size and relatively light tension on the cartridge. Most reloading presses will handle a full range of handgun ammo as well as intermediate rifle cartridges with no problem. 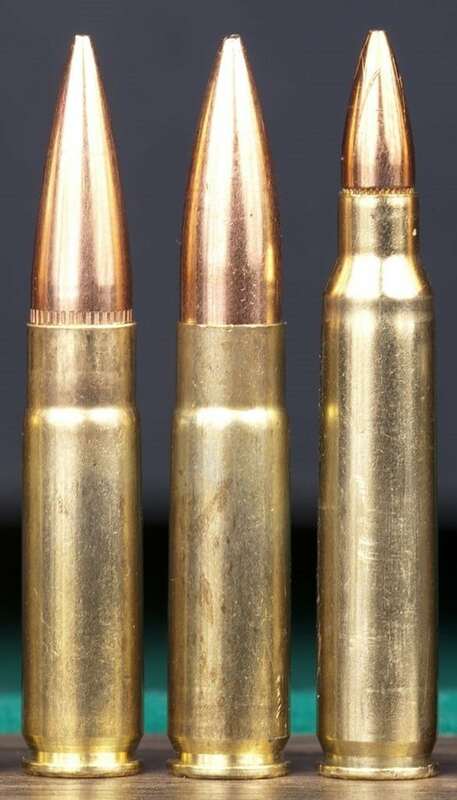 Larger rifle cartridges, especially the extra-long magnum rounds, may require a specialized press or may not be compatible with the full range of features on an automated press. If you want the flexibility to load monster cartridges like .416 Barrett or .50 BMG, you might be looking at a whole other class of press that has the capability for a cartridge of that size. And, if you want to load shotshells, that’s a whole other game than metallic cartridges! Buying dies and other pieces can get expensive. You’ll naturally want to be able to get your full use out of the equipment you buy. So, you’ll want to make sure that the dies you want are compatible for the press you want. ​If you have some equipment already, or plan to buy some in the future, it would make sense to plan your purchases so that all of the parts are compatible with each other. ​Loading your own ammunition offers many advantages. The ability to reload means not being dependent on factory offerings, making the loads that you need, and maybe even cost savings. ​Reloading ammo is known to be a great cost-saving activity. By buying components individually, the prudent reloader can take advantage of bulk buys and large component purchases to drive down the cost per cartridge loaded. Additionally, components can be reused. The first one, obviously, is brass, which can typically be reloaded numerous times safely. Of course, the primer and the powder are consumed and non reusable. Typically, bullets are expended also, but some reloaders take this to the extreme by trapping their fired bullets and re-casting the lead into new bullets! Firearm brass is often disregarded by shooters who don’t reload, so reloaders can often find themselves with free components by simply asking their shooting neighbor nicely to pick up unwanted brass. Shooters who cast their own lead bullets can drive their price per shot way down. Lead bullets also tend to use low-pressure recipes (or even black powder loads) which will significantly expand the life of a piece of brass. ​Reloading your ammo puts you completely in control of the process. You choose what components to use, you work up your loads (often to a specific firearm), and you are responsible for every step of manufacturing and quality control. For a lot of people, this can make reloading seem daunting. It’s a big reason why many shooters are content to stay with factory ammo. On the other hand, for the shooter who really loves their craft, sometimes nothing else will suffice. 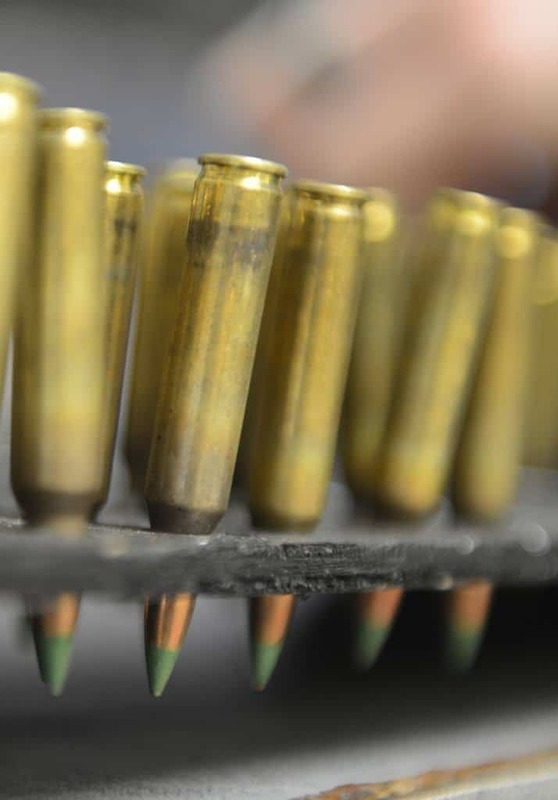 Many experienced reloaders feel that they trust themselves more than a factory, and like the facet of having control.The ability to load your own ammo also opens up possibilities that don’t tend to exist in factory ammo. For instance, creating a low-recoil light load or a high-pressure “hot rod” load. Pushing either end of ammo being too weak or too strong can be dangerous. An experienced reloader has some safe space for experimentation outside of factory offerings. ​As a general rule, gun owners tend to be an independent group who value their ability to take care of themselves. Gun ownership is seen as an essential part of freedom and preparedness. Having the ability to load custom ammo gives one a measure of self-sufficiency and security. If the firearm is seen as an essential tool of independence and freedom, some don’t like being at the mercy of ammo being available on the market. The ability to reload also creates the ability to reuse certain essential components, increasing the life of ammo availability in the case of a shortage. As was famously said, “only accurate rifles are interesting.” Much of the shooting sports community today revolves around shooting firearms as accurately as possible. Although factory “match” ammo is getting better and becoming more available, nothing competes for true precision like custom loaded ammunition. The first major reason is quality control and manufacturing. No matter how premium the ammo, it would really just be unfeasible for any ammo company to pay as much attention to every individual round as can the shooter who lovingly loads it for their rifle. ​Additionally, it’s a well known idea that rifles have a temperament and “like” certain ammo better than others. Experimenting with which ammo your rifle likes is an accepted part of accuracy testing and breaking in. Sophisticated measuring gages and hand-loaded ammunition have the ability to truly wring the absolute best accuracy out of a rifle, filling all the gaps that factory ammo can’t. ​Guns have a fascinating historical element to them that many collectors and shooters love. The core of firearms technology (the metallic cartridge) has remained almost unchanged for close to 150 years now! Unfortunately, in that time, many cartridges were invented to fill a need which did not take off commercially. There are many great historical pieces today which are rarely fired for lack of available ammo. Reloading allows the historical collector to make their own hard-to-find ammo and enjoy their historical pieces without dealing with astronomical custom ammo costs. It’s a lot more plausible to buy a set of dies for rare, obsolete ammo than it is to try to track down few, rarely-produced boxes and paying several dollars for every pull of the trigger. It also allows the shooter to tone down loads to low-pressure levels to preserve older, weaker firearms - especially those made of inferior metals such as damascus twist steel. Although there is inherent risk involved in this activity, many reloaders find this to be very rewarding. ​We’ve covered a lot of information already about reloading presses to help you pick the one that’s best for you! We’ve also identified 7 of our favorite reloading presses for different needs. Let’s take a look! ​At the end of the day, the top press for reloading is the one that will get the job done without fail and produce the best result. For this reason, we’ve selected the Rock Chucker Supreme by RCBS as our best press overall, along with the best single stage reloading pres. Some reloading operations subject the tools to a lot of force - when forming, bending, or even swaging metal (re-shaping a soft metal by pushing it through a die) the amount of force required can put serious strain on the tool used. The reason for recommending the Rock Chucker Supreme is its build quality and durability. It is easily one of the heaviest reloading presses you can pick up, and you can feel the quality immediately. It’s not unusual to hear this press compared to a tank. In addition, the Rock Chucker Supreme is built with the extra ram space to handle today’s extra long cartridges. Extra-long cartridges like Ultra-Mag, Lapua and Cheytac based cartridges require extra length and extra strength, which this press is designed to handle. The main ram on the press is made of steel and has a solid 1-inch body diameter to handle extra pressure. The handle is made of solid steel as well, and is extra long for exerting more leverage on the ram with ease. Operation on this press is smooth and comfortable, with no grittiness in the press operation. The press is a single stage press, which may appear to present a problem for the high-batch loader. Although this is not really the target market for the press, RCBS does sell attachments which convert the Rock Chucker Supreme to a progressive press - giving the reloader the best of both worlds. So, who is this press for? As our choice for one of the top reloading presses, we’re recommending this product to anybody who wants to start reloading and wants to invest in a good quality press that will last for years to come. Because it’s a single stage press, it’s great for learning the ropes and will continue being great for building accurate ammo for nearly any rifle imaginable. Long-range hunters and shooters will appreciate this press because it will allow them to load very long, high-caliber rounds where precision is far more important than quantity produced. In general, any rifle shooter will find great use and versatility in it, but those who are solely production focused might want to keep reading and consider some of the progressive presses we’ll take a look at a little later. The Rock Chucker Supreme was built to be a single stage rifle press that can handle all manner of heavy-duty, high force reloading applications and continue to do so over a lifetime. For this use, it is highly recommended. Against some of our other pieces, we see that the quality of this press is very high and it is a press that can be counted on. However, the price is relatively high for what it is. Not a lot of additional features are offered for the price, such as the progressive press we’ll look at or one of the complete reloading kits. ​Durable, versatile, and powerful, this press is one you can count on for years and years to come. ​A progressive reloading system greatly increases the speed of production. In this category, we like the Hornady Lock-N-Load press. The Lock-N-Load is a 5 station progressive press with plenty of features to help you produce ammo faster. One of the features that identifies the Lock-N-Load is the quick-change bushing system for replacing dies. With the bushing system locked in place, the reloader installs and sets their die as would normally be done to set up a batch of ammo. However, the bushing (with die attached) quickly removes and stays set. The beauty of the Lock N Load system is in the ability to pre-set all of your bushings and have them ready to go at any time. When it comes time to change to a different caliber, simply swap in your other set of bushings and get ready to load. The whole process can be done in under 5 minutes. That’s not the only efficiency system the Lock N Load press has, however. Quick-change metering inserts allow you to quickly change the powder dispensed, going from one type of ammo to another very quickly. The automated de-priming and priming system removes one annoying part of case prep, further automating the whole process. It also features a priming system that can quickly change from large to small primers to speed up the caliber transition process. Smooth operation also contributes to the efficiency and ease of use. The Lock N Load features a linkage system that helps amplify the user’s force input for stronger, more efficient operation. The progressive turret also works on an automatic indexing system with two part operation - half a movement on the down stroke, half on the up stroke - which reduces necessary energy. With an active spring retention system, shells can be easily removed or loaded for inspection or manual adjustment at any time. The result of all this efficiency is greatly increased manufacturing capability - the Lock N Load is able to produce more than 500 rounds in an hour. Compare that to 100 for a single stage press or 200 for a well set-up turret press, and you can see the potential for output! The Lock N Load progressive press is a very sophisticated piece of equipment designed for the high-throughput reloader. But, it might not be the best choice for everybody for exactly this reason. Because it’s a sophisticated system, there are some drawbacks. This progressive press is for the shooter who really wants to crank out a high volume of ammo, especially with the flexibility to “tool up” for several different calibers. Among this market would be the competition or sport shooter who burns through a high volume of ammo in training and needs to maintain this amount with consistency. This might include competition shooters who need to load a high volume for both their rifle and their pistol. Or, the shooter who shoots multiple divisions and needs to load different calibers for each game they shoot. Of course, the up front cost and sophistication is going to prevent a lot of people from being the right fit for this tool. Additionally, precision rifle shooters who need to make every shot count with extreme precision might want a process where they can see and control each round much more closely. Compared to the other products we’ve looked at, the Lock N Load press is definitely on the highest end of the price scale. It is an investment for those who really care about the shooting sports and want to really ramp up their capacity to stay in control of their ammo. If that is you, this press is highly recommended as one of the best progressive reloading presses. If you don’t need this capability, though, you might be incurring extra cost and complication when it could be better served elsewhere. ​An accurate, and complex press for the sophisticated reloader. ​A turret reloading press splits the difference between single stage and progressive presses in terms of production capability. Although less rigid than a stout single stage press, the turret press contains all operations of the reloading process in one set up. The Lee Precision Classic Turret Press is a great way to get started reloading on a budget. Recommended for both pistols and rifles, the Lee Classic Turret can handle rifle cartridges up to 3.3 inches in length, enough for most non-magnum rifle cartridges. By setting up an independent turret for each caliber needed, the reloader can have different caliber setups ready to go as necessity indicates. For the low cost of the press, it offers very reasonable quality. Although it won’t have the rock solid construction of a heavy single stage press like the Rock Chucker Supreme we looked at, it doesn’t fill the same need and instead focuses on production capacity. What the Lee Turret Press does have for the very affordable price is a solid cast iron base. It also features a solid steel linkage for solid transfer of power and long term durability, making it the best reloading turret press. Additionally, the press is equipped with a large diameter ram for stability. Even better, the ram is drilled all the way through and has an attached clear PVC pipe. When brass is deprimed, the spent primer is caught in the tube with no chance of a spill or loss. This is complemented by the Lee Lever Priming System. For the price, features, and build quality, the Lee Classic Turret Press is an appealing option for many middle-of-the road shooters and reloaders. It’s capable of handling everything from handgun rounds to intermediate cartridges for your modern sporting rifle and even full length cartridges for your hunting rifle. Because of the compact, quick-change turret system, the press allows a shooter to tool up for several different calibers without too much additional storage space. The ideal user for this press is the shooter who needs a general-use reloading press, for not a ton of money, and wants something versatile with a good return on their investment. It provides great utility for the sport shooter who wants flexibility to reload for different kinds of target shooting, sport competitions, and hunting with one unit. For the price and range of features, it’s hard to beat for a good mid-level reloading press on our list. It’s not going to be as strong as the Rock Chucker Supreme, or as cheap as our budget option (we’ll get to that later) but would be a solid middle-of-the-road choice for many shooters. Of course, reloading involves more than just a press. So, if you’re looking to get an all-inclusive kit with these kinds of features, keep reading to find out what else we cover! ​Our favorite single stage reloading kit is back - and with a few extras to get the beginner started. Let’s take a look at the RCBS Rock Chucker Supreme Master Kit! In addition to the great press (check the full review above), the kit is full of other great accessories to get you started reloading. If you’re the kind of person who’s looking for a complete kit with recommended accessories, this kit has been built to get you started in the right direction. ​Nosler Reloading Manual: Arguably the most important piece of any kit! A reloading manual provides necessary information on safe and uniform cartridge loads and development to keep users within safe and established pressures and dimensions. ​Universal Case Block: Holds your cases and aligns them for loading. ​Case Lube Kit: Necessary for smooth operation. Properly lubed cases move and re-size freely and help prevent binding, jamming, and other damage with the die. ​Mechanical Scale: Allows the reloader to accurately measure out an amount of powder using a reliable mechanical system. Sensitive to within 0.1 grains of powder, and taking advantage of anti-magnetic properties, the scale offers a high degree of accuracy, making it the best reloading press for accuracy. Uniflow Powder Measure: Dispenses a consistent amount of powder and eliminates issues with powder “clumping” and releasing in large quantities. ​Of course, this also includes other small parts such as a hex key set and powder funnel, to tie the whole kit together. Although this kit is almost everything needed to get started, it’s important to know that it doesn’t get quite there. Dies and shell holders are required for your caliber of choice to get you started on your reloading journey. This kit combines our favorite reloading press with a bunch of great tools needed to get the reloader started. There are many advantages to this kit. While this kit does provide a great amount of convenience and help a shooter get started in the right way, there are some potential disadvantages. Because of the super sturdy design of the Rock Chucker Supreme press, and the versatility of handling everything from pistol to ultra-long rifle cartridges, we recommended the press for a wide variety of shooters who want to invest in a press that will do most any job and last a lifetime. The completed kit is highly recommended for shooters who are interested in investing and quality and want to get started by saving money and effort buying a pre-assembled kit. More experienced reloaders might find that they don’t want all of the included pieces or would find that they would rather swap out pieces. In this case, buying the whole kit could be more costly for them. Naturally, this kit is the most expensive item on the list, which may be an issue for the more price-sensitive readers. However, it does combine our favorite very high quality single stage press with a very nice package of components ready to get the reloader started. For a reloader looking for a ready to go kit at a slightly lower price, keep reading for our review of our favorite turret press reloading kit. ​Our favorite turret press has also come back in kit form, with the Lee Classic Turret Press Kit. Like the RCBS kit we looked at above, this kit takes a solid, highly-recommended reloading press and builds a full kit around it. As noted in the review above, the press is a 4-station turret press, which allows turrets to be set up individually for different calibers and swapped out as a whole. This is great for producing batches of handgun and small rifle ammo - however, the auto rotation can also be disabled for manual loading and operation of larger rifle cartridges. This kit comes with everything you need to begin reloading - with the exception of a set of Lee dies in the caliber you want to reload. ​Case Prep Tools​: Case resizing lube and a variety of case prep tools - including cutter, chamfer tool, and cleaners for both small and large rifle primers. ​Powder Scale​: Mechanically measure the amount of powder dispensed to an accurate level. Also magnetically resistant and guaranteed accurate for life. ​​​​Powder Measure​: Auto drum powder measure to dispense accurate and consistent amounts of powder. Also comes with the required riser to create the appropriate clearance. ​Reloading Manual​:​​​​​​ As we stated earlier, the reloading manual is a crucial part of a reloading system to keep the reloader operating in known and safe territory. The included manual covers 167 different cartridges. This kit is great for the person who wants to get into reloading and is more concerned about production capability across a common spectrum of calibers. This would include a number of handgun and small rifle calibers. It’s also a budget-minded way to get started with a complete kit and the guidance that provides to making sure you have the correct pieces. One of the biggest comparative advantages for this press is what’s included for the price. The cost of this kit is very close to the cost of our favorite press, the Rock Chucker Supreme, without any of the additional accessories included. As far as production speed, it sits in the middle of the road. The auto-indexing turret provides a production capability of 250 rounds per hour - faster than our single stage press options, but easily eclipsed by the Hornady Progressive press we looked at earlier. In terms of value, this is a highly suggested item for somebody who wants to stretch a budget to cover a whole reloading set up. For a real budget-stretcher (with fewer features and options) keep reading for our budget pick if that’s your most important priority! ​A complete set coupled with a high ​capacity ​production press. ​For dedicated shotshell loading, we recommend taking a look at the Lee Precision II Shotshell Press. Although it may be taken for granted that ammo is ammo, shotshell reloading is a whole different beast than metallic cartridge loading. There are more components to consider. Additionally, with no bullet loaded in a case to seal the cartridge, shotshells are reliant on a crimp. Rather than try to be an all-in-one reloading station, the Lee Precision II is a dedicated, unobtrusive loader designed to be a complete 12 gauge reloading station. The press comes with bushings to measure out powder, as well as to measure an appropriate amount of shot for different shot sizes. With this unit, speed isn’t the focus as much as simplicity and value. This is not going to be the machine that you buy to crank out cases of shotgun shells overnight. However, it is going to be the machine that you can buy for just the price of a few boxes of shotgun ammo and be capable of making your own loads. The loader is capable of loading and crimping both plastic and paper shells, so you can load antique style cartridges as well. The press is capable of loading shells up to 3” in length without any conversions or additions necessary. The best thing about the Lee Shotshell loader is the utility it provides to load shotshells for a very low cost - less than a case of trap shells. It has a lot to offer. The market for this product is pretty self-explanatory. Any shotgun shooter who wants to be able to load their own shells for cost or customization can benefit from this low cost investment. In particular, it would pay off well for those who have vintage shotguns and want to use low-pressure black powder or paper loads. Additionally, it may be a worthwhile investment for the more seasoned reloader who wants to free up space on other equipment. By moving all shotgun reloading to a single unit, those resources can be permanently off-loaded from other presses. This press is highly specialized. It does what it does, and that’s pretty much it. The value is in the simplicity. It is the cheapest press on the list, which is notable for a person who only wants to get into reloading for shotshells. Unlike other products that we’ve looked at, it is completely self-contained. ​We’ve looked at a lot of great reloading presses so far, and covered a whole range of options. However, maybe you’re looking for something solid and super budget friendly to get you started or even augment the equipment you already have. We’d like to recommend the RCBS Partner. The most inexpensive of the RCBS single stage presses, it still retains the solid construction they are known for while offering a very economical starter press. The partner is a compact single stage press that weighs less than 5 lbs, making it ideal for setting up in a tight location or even bringing to a portable location such as the shooting range or a hunting cabin. Despite its small size, the Partner has enough room to handle cartridges from handgun rounds to full size hunting rifle cartridges. The press is also capable of handling a full range of operation from bullet pulling to crimping, depriming, and even priming with its own priming arm. For the money, this little press has earned a reputation for being a hard worker and, especially, an important tool for the reloader or match shooter on the road. Having the ability to load for the conditions of the range is an important advantage for the expert shooter and reloader who understands the game at a high level. For the budget-minded reloader who wants a capable, portable reloading system to cover a wide range of calibers and isn’t bothered by a single stage press, the RCBS Partner is a very solid recommendation. It’s also a worthwhile purchase for the reloader who already has other equipment and wants to boost their existing capabilities. This press could easily be set up to dedicate to a single operation - such as crimping, pulling bullets, or whatever else reduces load from your other presses. For portable use, the Partner offers a durable and relatively strong system that can be taken on the go. Load development can be done right at the bench, and the press is small enough to pack as gear for an event - such as a shooting competition - where having the ability to reload on scene is a huge advantage. Compared to the Rock Chucker Supreme that we looked at earlier, this could be considered kind of a “little brother” counterpart. Smaller, cheaper, more portable, but ultimately lacking the major muscle. A shooter more minded towards production could purchase a turret press like the Lee Classic we looked at earlier for not too much more money. That would ultimately be a personal choice, as a single stage press like the Partner is going to be more rigid and adept at handling larger rifle cartridges, as opposed to the higher production speed of the turret press. ​Powerful, compact performance that packs a punch. ​As you can probably see now, there are many factors to consider when beginning reloading and looking for the best reloading equipment. Although it can seem an overwhelming new skill at first, being able to custom load ammo really opens doors for the shooter who loves having more control over their craft. Hopefully you feel better equipped to pick a good reloading press set up for you. Remember to check out our other guides for more great informative content! If you are a frequent shooter, you have two primary choices when it comes to the source of your ammo. 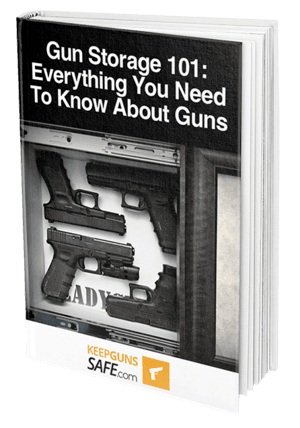 The most common option is to just purchase new boxes of ammunition and take no part in the loading process. This choice is admittedly quick and convenient, but you may end up missing out. If you would rather not purchase your ammunition complete, you have the option of handloading your cartridges. However, if you are going to be handloading, you will need to find the best reloading press to ensure that you can do the best job possible. Let’s not get ahead of ourselves, though. Handloading is precisely what you would expect upon hearing the name, it consists of loading your cartridges by hand, but since you're already here, you probably already know that. Instead of giving a basic overview of handloading before our best turret reloading press reviews, let's take a look at why you would want to start. Handloading has many significant advantages when you compare it to merely purchasing boxes of ammo without a thought as to anything aside from the caliber. When you load your own brass, you get to save quite a bit of money, as you will no longer need to purchase cartridges whole when you want to shoot. Loading your own bullets and cartridges is an excellent way for a frequent shooter to cut down on their expenses, but there are reasons for handloading beyond the economic. For example, loading your cartridges will give you much more control over the performance of your bullets as you can measure the powder load yourself. Of course, if you are going to be dealing with gunpowder, bullets, and casings, you are going to have to expect a small element of danger. Weapons are not toys, and they never will be. A cartridge (and by extension, its components) should be treated with all of the respect that is due to an actual firearm. When it comes to safety, you will want to ensure that you thoroughly check the walls of your casings for any fractures, and ensure that you never overload a cartridge. There are many ways that you can potentially injure yourself while handloading, but it will usually be due to an overloaded cartridge. As long as you ensure that you never exceed the design specifications of a particular cartridge, handloading can be safe and economical pursuit. If you are just getting started, the hobby becomes much less intimidating (and some might even say more enjoyable) as you get more experience under your belt. 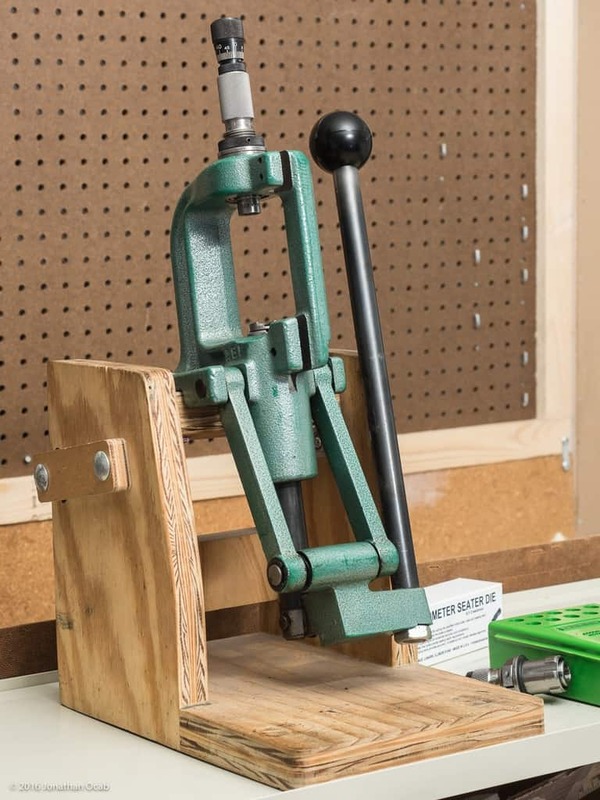 The best reloading press for beginners is the RCBS Rock Chucker hunter's reloading press. While this press may be specialized for hunting cartridges, nothing is stopping you from using it with cartridges that have a lower power load. The ability to support a wide range of cartridges makes this an incredibly versatile press. Regardless of whether your left hand or your right hand is the dominant one, you will be able to use this reloading press due to its ambidextrous compatibility. All you have to do is loosen the nut on the bottom of the loading handle and move it into the other slot, and you will be ready to get started. Speaking of the handle, there is nothing overtly ergonomic about the design, but it is comfortable enough to ease the strain of repeated use. This reloading press features a typical ball handle that is made of solid steel. While this type of handle may not be the most comfortable, it is simple and affordable to build. While this reloading press is capable of working with larger hunting cartridges, it features a relatively compact design that makes it portable enough to help ease installation. Of course, this is still a relatively solid piece of metal, so keep in mind that the reloading press will be heavy. A single-stage reloading press may not be ideal for your needs, but this helps improve reliability when compared to a press that makes use of several stages. Multi-stage presses simply have too many moving parts to function as reliably as their more simple cousins; a single-stage press should be fine for most applications. This reloading press can be found for a mid-range price, and we would argue that it is worth the extra money you pay. The inclusion of features that can’t be found on low-end models allows you to make your handloading process much more convenient, so we would highly recommend this product if it fits your budget. Up next on our hunt for the best reloading press, we have a model from Lee, one of the better-known names in this product category. This particular reloading press is ideal for beginners who are unsure if they will end up pursuing the hobby due to a combination of low price and convenient design. If you aren’t sure about handloading, the low price of this model helps you decrease the financial risk of trying it out in the first place. Nobody wants to have to invest in a 300 dollar reloading press only to find out that they don’t even enjoy the process of handloading in the first place. What this reloading press may lack in sophistication, it makes up for in reliability and superior value for money. If you want the most bang for your buck, few models can compete with the price tag of just under 40 dollars for this Lee reloading press. This unit is ideal for more experienced handloaders that are looking to prime and deprime their cartridges. Depriming can be messy work, and you don’t want your main press covered in residue. As long as you purchase the necessary accessories, you will find that primers are dealt with conveniently by this press. If you are tired of other reloading presses dropping down and accidentally pressing your fingers, you won’t have to worry about that with this model thanks to the balanced lever design. Since the handle can be found in the bottom center of the machine, the motion of pressing a cartridge is relatively straightforward. While you may be surprised to hear it, this is one of the most reliable reloading presses that you will come across at this price point. In fact, Lee are so confident in their product that this reloading press comes included with a two-year manufacturer warranty that is unconditional. The only reason that this press missed out on the title of best rated reloading press is that it may not be too user-friendly. While the RCBS press (the winner) combined quality and reasonable price point into one convenient package, this reloading press is more expensive but also more capable. This reloading press is an excellent choice for prolific shooters thanks to the turret design. A turret reloading press is capable of supporting multiple dies at the same time. Since this press is optimized for use with pistol cartridges, we would recommend purchasing this model if you are an avid handgun shooter. Support for up to six dies means that you will have a wide selection of ammunition to handload without having to take the tedious step of swapping out a die. If you already have a reloading press, and you main stick to a single caliber, it is hard to recommend this press, but it is ideal otherwise. The ball handle has been coated to resist rust, and it is ambidextrous. As with most other reloading presses, all you have to do is slot the handle into the spot on the left. The turrets on this model can be swapped out for replacements in relatively short order so that you can work with more than six calibers at a time. A machined flat base means that you will be able to mount this reloading press to your workbench as evenly as possible. The mounting process is also relatively simple, which is not something that you can say about every model of turret reloading press. All in all, this is an excellent reloading press for more experienced handloaders due to the higher price and the improved capabilities of this model when compared to the other choices. If you need to work with several reloading dies at the same time, this is the product for you. As with any other product that will have to be semi-permanently mounted to your workbench, you want to ensure that your reloading press is the right choice before you buy it. It can be a hassle to have to mount and dismount several reloading presses until you find the right model, so you will likely have to compromise. Nobody wants to have to compromise, so ensure that you get the best possible reloading press on the first purchase. The ammunition with which the press is compatible is the first consideration to make before your purchase. Depending on whether you are trying to handload pistol cartridges or full-power hunting rifle loads, you will need a reloading press that is optimized for a specific range of cartridge dimensions. There are also several different types of presses, but for this review guide, we will go over two. The traditional manual press features a single die and a relatively simple design. On the other hand, a turret reloading press features a row of dies for improved loading versatility. You will want to ensure that you find a reloading press of sufficient quality when you are making your purchase. A quality press will make it easier for you to handload your cartridges in the first place. Superior construction also usually makes for a product that will last longer. The matter of superior construction brings us to our last point, which is closely related to quality. You will need a press that is durable enough to last long enough to provide a reasonable return on your investment. Once a press has paid itself off in affordable cartridges, you know it was worth the money. We hope that our short review guide has been able to help you find the best reloading press for your needs. While it may appear challenging to find the ideal model of reloading press, it becomes far easier with the help of some trusted reviews.